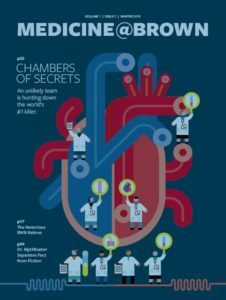 Computational biologist Sohini Ramachandran and her team are mining human genetic data to understand the impact of our ancestry on our health. Not long after Sohini Ramachandran, PhD, joined the Department of Ecology and Evolutionary Biology, in 2010, Brown’s undergraduates were buzzing about the new assistant professor. Aaron Behr ’15, who was studying biology and computer science, heard similar talk. “Dr. Ramachandran was consistently recommended as a really great person to work with, a really great adviser doing really interesting research,” he says. It was the kind of recognition Ramachandran had hoped for when, as a postdoc at Harvard, she was mulling offers for her first faculty appointment. “I really wanted to be in a campus like Brown where I had access to undergraduates and could mentor them,” she says. That’s because mentors played a big role in the shaping of her academic career, beginning when she was just 15 years old. In the lab of Stanford biology professor Marcus Feldman, PhD, the high school student found what seemed to her an uncommon degree of acceptance and encouragement. “Not only did he give me my own project and treat me like a researcher, but his whole lab did. That was the culture that he created,” she says. Last year Ramachandran was granted tenure as well as the directorship of Brown’s Center for Computational Molecular Biology (CCMB). 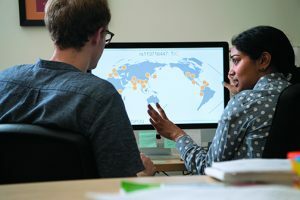 Now an associate professor with joint appointments in biology and computer science, she is fulfilling her goal to “pay it forward,” regularly welcoming budding young scientists into her lab with equal measures of support and autonomy. Ramachandran’s path to science began with role models at home. She grew up near Sacramento, where her parents were statistics professors in the California State University system; her sister, Raga, who is seven years older, told one of her biology professors at Stanford about Sohini. Ramachandran stayed at Stanford, but decided to major in mathematical and computational sciences as an undergrad. By then, her sister was in the MD/PhD program at the University of Pennsylvania. “I didn’t really want to compete with her,” Ramachandran says. “I thought, I have to do something different from her. And I was still drawn back to biology.” As she considered PhD programs, she consulted with Feldman, who was thrilled to welcome her back to the department. And her timing couldn’t have been more perfect. The draft sequence of the human genome was released in 2001; evolutionary and medical geneticists thought they’d struck gold. “The idea was, this is going to unlock all the answers to human health,” Ramachandran says. She began working with Feldman to characterize the distribution of human genetic diversity throughout the world. “One genomic sequence doesn’t fully capture how human genetic variation, which is quite low compared to other species, is distributed and may contribute to disease,” she says. But by using the human genome as a “historical text” for her dissertation, she proposed the serial founder effect model that showed that our genetic diversity today decreases with geographic distance from Africa, where humans originally evolved. After Stanford, Ramachandran was elected to the Harvard Society of Fellows, where for three years she studied coalescent theory, a statistical approach modeling genetic divergence from a common ancestor, with John Wakeley, PhD, a professor of biology. Around that same time, Brown was building on the success of its undergraduate computational biology concentration to found an interdisciplinary center that would bring together expertise in biology, math, and computer science to mine genetic data for answers to questions about evolution, ecology, and disease. The new Center for Computational Molecular Biology needed faculty, and Ramachandran took note. Ramachandran chose Ecology and Evolutionary Biology as her home department even though, she jokes, “I never took a biology class.” But this was a “huge bonus for EEB,” says department chair David Rand, PhD, the Stephen T. Olney Professor of Natural History, who helped establish CCMB and hire its founding faculty. Location played a role in Ramachandran’s success, too. EEB had no available office or lab space in its buildings, so she wound up in the Center for Information Technology instead. “That’s been a real blessing, because being physically so close to [computer science]and to applied math has made collaborating a lot easier,” she says. Rand says “some very exciting papers” have resulted from that proximity. “That’s exactly the kind of synergy you look for,” he says. GLOBAL VIEW: Sam Smith PhD’23 (left) is a graduate student in Ramachandran’s lab. Now, as director of CCMB, she says she’s excited to grow the center’s collaborations further, and “strengthen the interdisciplinary community that’s focused on molecular genetics and genomics.” And again, it’s all about location: next spring the center will move a few blocks north to the newly renovated Brown Office Building, which will also house the Data Science Initiative and the Carney Institute for Brain Science. CCMB is hiring a new computational biologist, as well as a geneticist who specializes in ancient DNA with whom Ramachandran will advise an archaeology postdoc. A recent project with St. Jude’s Children’s Research Hospital exemplifies this. Researchers there wanted to understand why Hispanic-American children with acute lymphoblastic leukemia seemed more likely than kids of European descent to relapse following the same treatment protocol. To analyze the genetic data, Ramachandran; Ben Raphael, PhD, a former associate professor of computer science at Brown who’s now at Princeton; and her graduate student Priyanka Nakka PhD’18 developed PEGASUS, an open-source software package that analyzes gene associations by phenotype. They found multiple pathways to leukemogenesis. “There are different interacting genes that are producing the same disease in different ancestries,” Ramachandran says. The researchers are gathering more samples now, from affected children and their parents, to further test their findings. “We really want to push on it more quantitatively,” she says. Another potential collaboration arose after she gave a talk about PEGASUS to the lab of Abrar Qureshi, MD, MPH, the chair of dermatology. He mentioned that he’d observed an association in his patients between severe psoriasis and type 2 diabetes, both autoimmune diseases. “Is there a chicken and egg? Does one precede the other?” she says. His lab has a lot of data, she says; if she wants to take on this question, her lab has to figure out the best way to analyze it. “Sometimes I think the view people have about data science or machine learning is a very oversimplified one,” Ramachandran says, where there’s one tool that can be applied in any data context. But in truth you need a whole toolbox, and her lab is devoted to building the right tool for the right job. There’s PEGASUS; and pong, which she devised with Aaron Behr to rapidly visualize and analyze population structure; and SWIF(r), a technique her postdoc Lauren Alpert Sugden ScM’10 PhD’14 developed to identify adaptive mutations in human genomes. “You have to get pretty enamored with the data. And instead of having a hammer, you actually end up developing a screwdriver, and it has to fit in really well with the data. You have to understand the nuances of the data—the errors that might be generated in the data, the fickle nature of the data,” Ramachandran says. To do what she does, she adds, you also have to get excited about the context. “For anyone who is in computational biology, I think the complexities of organisms and the diversity of life are what really draw them and keep them in the field,” she says. 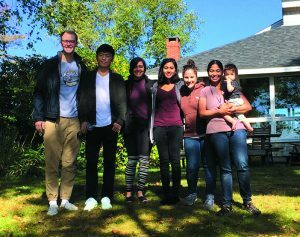 ON RETREAT: Ramachandran Lab members in Maine (from left): Sam Smith, Wei Cheng, Sahar Shahamatdar, Priyanka Nakka, Lauren Alpert Sugden, Sohini Ramachandran, and Neerja Mumford (age 1). And they genuinely have fun together. They go on weekend retreats to Ramachandran’s in-laws’ house in Mid-Coast Maine, to cook and hike and share downtime. They’ve done Escape the Room puzzles, and they play trivia games in the lab. When most of the group gathered on a cold day in early April to take a selfie in front of the CIT building for this story, they were crying with laughter. Besides team building and professional development, Ramachandran looks forward to the retreats as a chance to discuss the direction the lab’s going and plan the year ahead. “It helps solidify the themes that we’re focusing on,” she says. Feldman, whose inclusive, cooperative lab culture is a model for Ramachandran’s, says ever since his mentee was in high school, she was “always upbeat, always easy to interact with other people, generous with her time.” It’s been a “treat,” he says, to watch her become a consummate scientist, wife, and mother. “I don’t think I’ve ever met anybody who is as personally accomplished in every dimension of life,” he says.